A postmaster is counting the cost after raiders attempted to steal the cash machine from his shop. Dilip Karavada was woken by his shop alarm at Caldecote Post Office and Store on Hitchin Road in the early hours of Friday. He found the store broken into and a car ablaze outside. The raiders had broken in, tied a rope around the cash machine and then tried to pull it out of the store with the car. When it failed they fled, after setting light to the car. But Mr Karavada said he had to wait 25 minutes before the fire brigade arrived, which he claimed threatened his store and his home next to it. And he is now considering whether to keep the cash machine after the damage caused to his store. More than £1,000 worth of damage was done to the store’s door and shutters. A spokesman for Beds Fire and Rescue Service said the six man crew had been there within 11 minutes of receiving the first call. “When firefighters arrived on the scene they found a car on fire in the middle of the road outside the post office. Radiant heat from the vehicle had begun to affect the plastic facia of the Post Office but the fire was, at that time, no threat to the property or neighbouring properties,” he said. A post office in Shortstown has been targetted by robbers in a similar style raid on Wednesday but again failed to take the cash machine. Bedfordshire Police is reiterating crime prevention advice for businesses as a series of ATM ram-raid attempts continues. Chief Inspector Gavin Hughes-Rowlands said: “The latest attempts by organised groups of crooks have thankfully have been foiled by savvy businesses utilising crime prevention techniques such as installing shutters and keeping internal cash machines in a separately locked room. “We are doing all in our power to trace those responsible, but we ask that the public continue to help us by making every effort to secure their property. 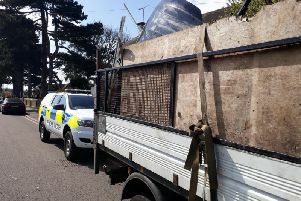 “Farmers with agricultural machinery and owners of large 4x4 vehicles should also ensure they keep them locked and secured as we know these are targeted by the offenders. Police are also keen for anyone with information about any of the incidents to come forward and report it using the non-emergency number 101, or Crimestoppers anonymously on 0800 555 111. Anyone who witnesses heavy plant machinery being moved around at night in suspicious circumstances is asked to call 999, as there is a strong chance it is being prepared for immediate use to commit offences.